Each home that we build is unique, one of a kind. Our homes are built with the finest quality logs. 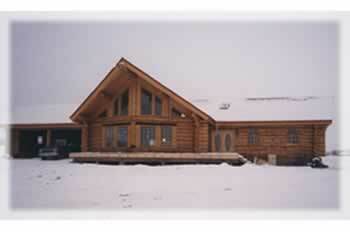 We use winter cut spruce from the Peace River area. Each log is individually selected, hand peeled with a draw knife and dry piled for a year, thus reducing the shrinkage. We use either the “full scribe” or the “chinked style” in the construction of our homes. Our handcrafted style is combined with knowledge, experience and quality workmanship to give you a long-lasting, unique home that truly expresses your personal lifestyle. Each home is a custom project designed to fit the needs, desire and budget of the customer. Our log packages include all log walls, joists, ceiling beams, ridge poles, roof purlins, rafters and log trusses if desired. Our contract includes precutting the plate logs to accept the roof system, drilling and installing through bolts, and cutting window and door openings and recesses for electrical boxes.